At Temponia we try to attain the opposite. By introducing features that serve a sole purpose: letting you gain time. We learned that It's often small improvements that can lead to a boost in productivity. Last week we introduced quick selection. 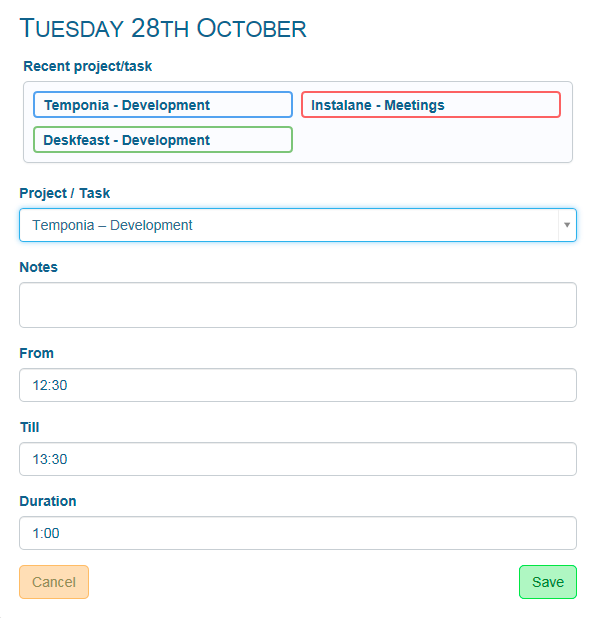 Whenever you are entering a new entry, Temponia will now display a list containing your last used most popular project-task combinations. If you want to reuse one, you can just click it, and both project and task will be selected allowing you to just enter optional notes and save the item. It is of course still possible to choose another project/task. In 1999 Entrysoft launched Timesheet Constructor. Best products start when you 'scratch your own itch'. Having no decent timesheet solution that allowed calendar input and visualization I created my own. Existing programs worked with a timer or direct input of hours. These can be perfect for your needs but when an employer of client demands detailed sheets containing begin- and end times then you're out of luck. Apparently I wasn't the only one needing a calendar based timesheet solution and over the year the user base grew. In 2003 the client/server version of Timesheet Constructor was launched. This version allowed multiple concurrent users to track time and have global reports. However it required a fairly complicated installation of SQL server.